As everyone knows, April, May and June are birthday months around here. Kyla, Ayden, Shay, Rebekah and little ol’ me were all born over a 40 day time period – over different decades of course. 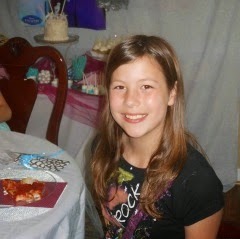 It seems like just yesterday my little Kyla-monkey was born. Of course, it wasn’t yesterday at all – it was 10-years ago – queue feeling old. Even more so than Christmas, Kyla’s birthday is her most exciting day of the year. It’s so exciting to her, that she often begins thinking about next years party the day after the current year. We have to rein her in and refuse to plan until at least after Christmas. 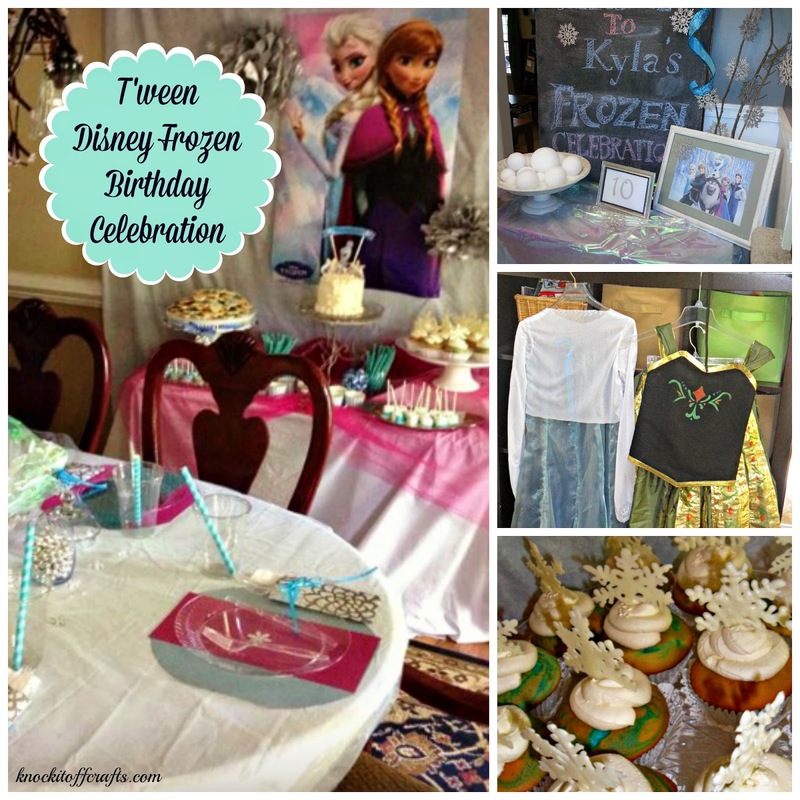 Still, it’s often we hear the phrase “So, Mom, I have an idea for my birthday party..” Although it drives every other person in our family crazy, it’s like music to my party-planning ears. She really puts a lot of thought in to it every, single year, and comes up with the most fun and unique party themes. Last year, we celebrated with a 50’s Sock Hop. Other years, long before I began blogging, there was Halloween in April, a glow-in-the-dark party, and a Divalicious make-over party. I always have such a great time bringing her ideas to life. 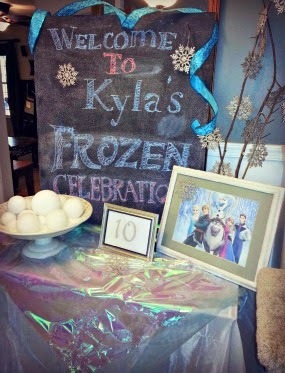 This year, she went a little more mainstream than other years, and decided on a Disney Frozen theme. The irony that we’re finally out of what seemed like an endless winter, and that we would be celebrating all things frozen and snowy was not lost on me, believe you me! From a planning perspective, my first thought? Piece of cake. 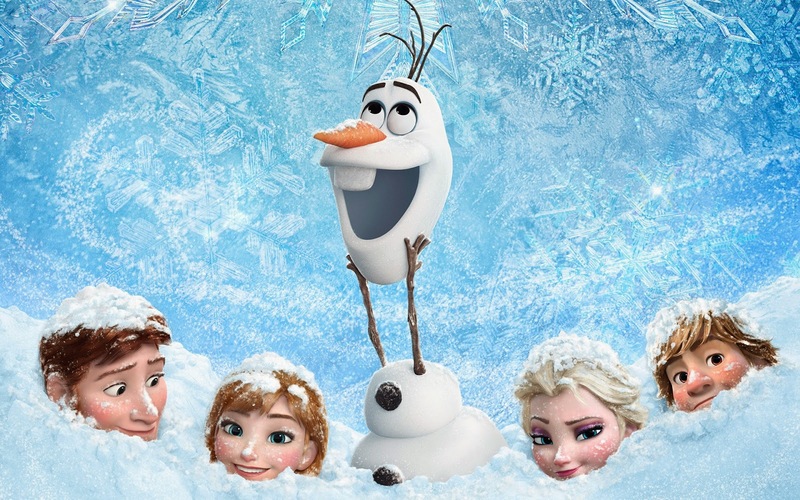 Frozen is everywhere – only.. I quickly found out that Frozen stuff isn’t everywhere. Frozen stuff is actually nowhere... so, what do you do when you can’t find Frozen anything? The only option.. Do it yourself. And that’s what we did. Luckily, I actually like cutting out little bits of paper, creating props and planning and decorating. I love the feeling of walking through the door, and bam! you are in the theme. It always begins with the invitations. 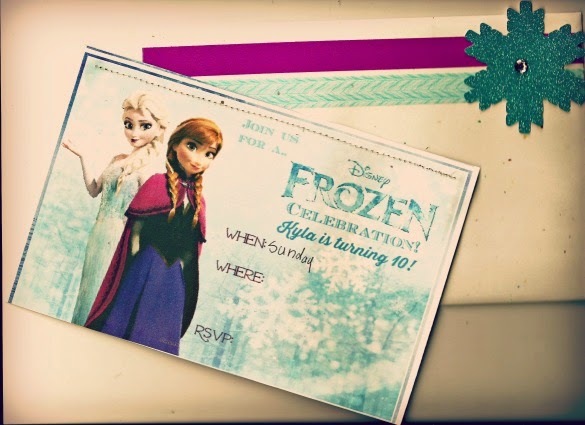 Kyla and I made the invitations together using card stock, cellophane and chunky glitter. I wanted to give the illusion of a snow globe and found a fabulous tutorial, that I loosely followed. Because of the wording on the front of the invitation, I wasn’t able to use the wax paper recommended, and after trying to sew the cellophane with less than positive results, I decided on craft glue to secure the cellophane to the front of the invitation. The glue is really noticeable in the photo, but not so much in real life – It was really, really difficult to photograph, but you get the idea. We used generic card envelopes and die-cut snowflakes. To jazz things up, we used washi tape to add a border to the envelopes, and attached a unique snowflake die cut from my silhouette out of glittered card stock – remember, no two snowflakes are the same! With the invitations out of the way, it was time to set the scene! This party was quite a bit smaller than our norm – we planned to include ice skating in the festivities, and as a result had restricted the guest list. It was nice for a change and a lot more intimate, and it also meant we could really turn up the volume in the areas the guests would be spending time. 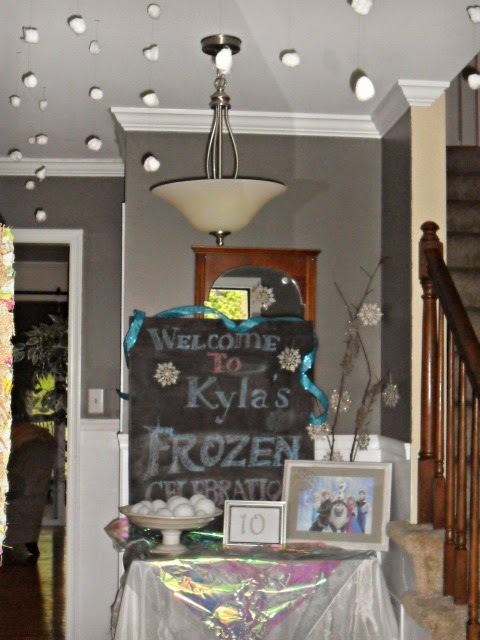 At the front entrance as our guests arrived, they were formally welcomed to the celebration by a narrow path of gently falling snow, as if Elsa herself had given the girls their own private snow cloud. The mood was set with snowflakes galore, and a bowl of snowballs – multi-sized foam balls nestled in a bed of artificial snow. 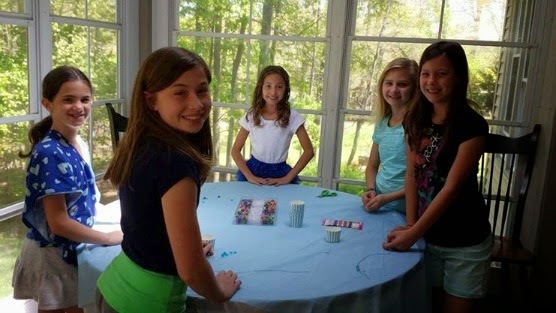 The path of snow lead the girls to the first activity of the party, the “ice bracelet” station, where each girl was able to create a beaded bracelet. 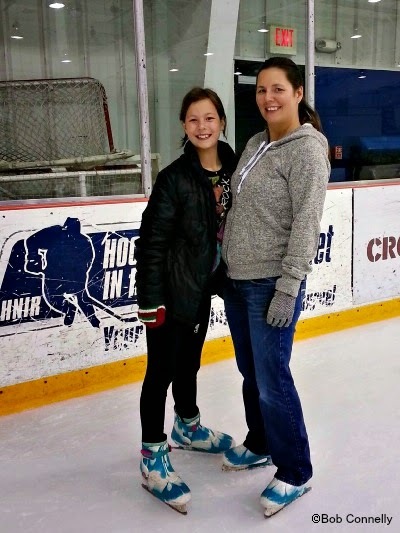 It was an inexpensive craft, and a great ice – get it? 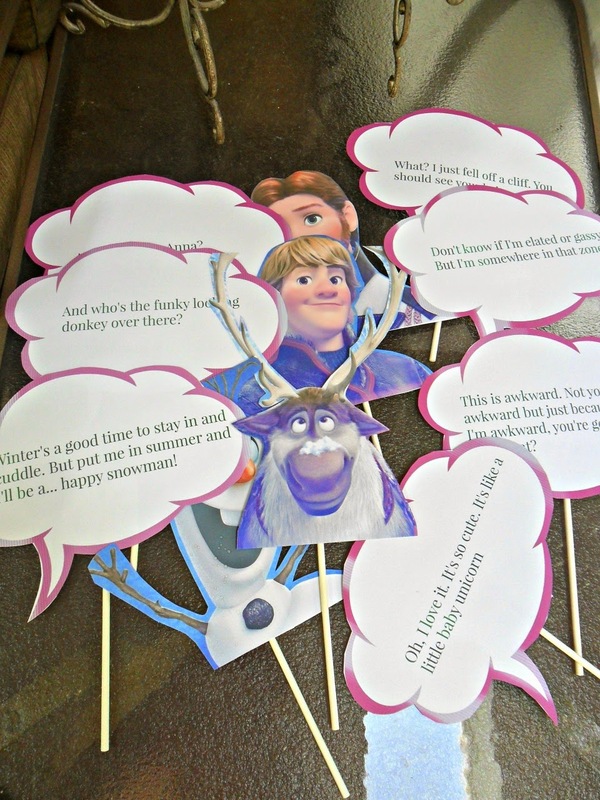 ice – breaker, that kept everyone entertained until all of the guests had arrived. Next, the girls gathered outside for a “snowball” fight! 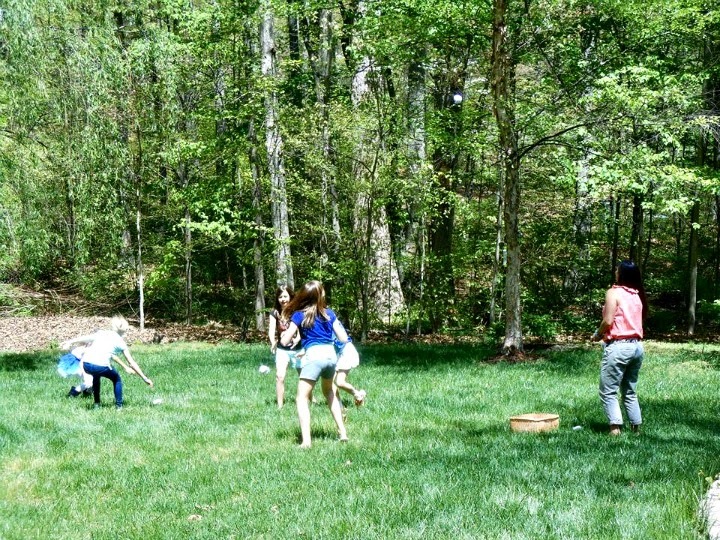 Using balled up white socks, the girls ran around, giggling, laughing, and launching “snowballs” at one another in dodge ball fashion. And.. after seeing this picture, I’m never wearing that outfit again. Don’t you just hate that?? Next up? 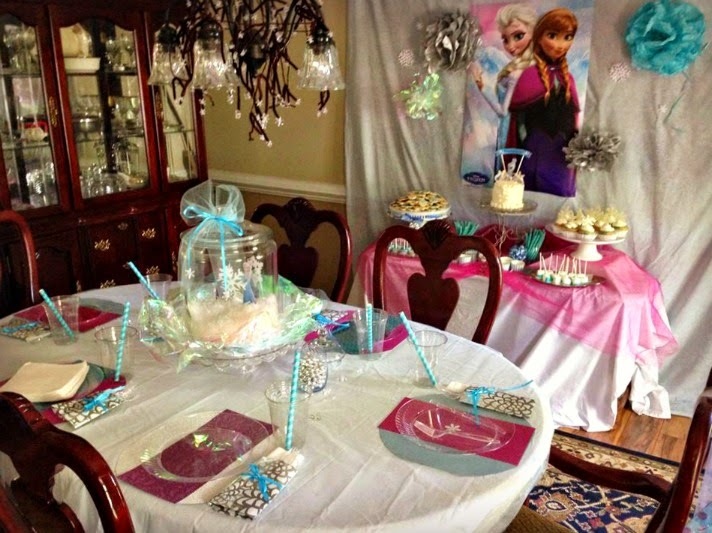 Lunch – served in the “Frozen Dining Room”. I don’t know what it is, but I love doing up a ceiling. In this case, using white vinyl table cloths gave the illusion that the ceiling was sort of floating. Ayden took one look at it and announced it was time for trick-or-treating, since we often use this technique for our annual Halloween party. Sorry, buddy.. we’ve got a few more months! 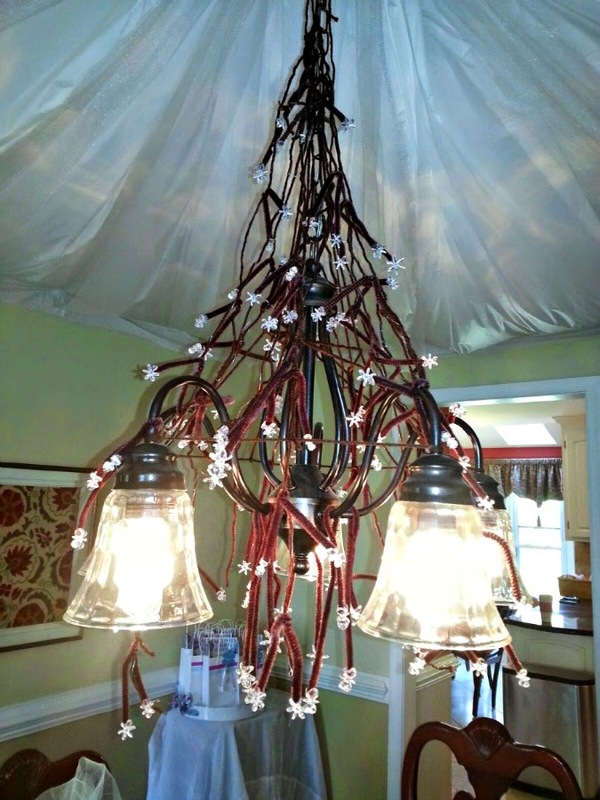 The chandelier got a bit of a make-over as well. 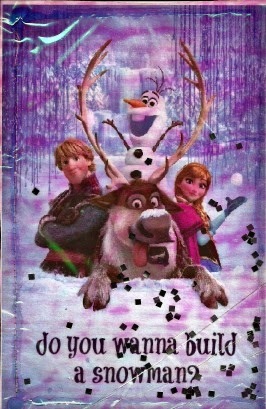 My favorite scene in the move is when Anna and Kristoff meet up Olaf in the forest. The forest really is so beautiful with the frozen weeping willows – my favorite tree – and I wanted to recreate that a bit. Using a glue gun, I attached snowflake beads that I found at Michaels to both ends of brown pipe cleaners cut in half. I, and a ton of help (think Bekah and Melinda) created about two dozen long strands of wool, wound in very thin floral wire. I attached the pipe cleaner pieces to the wool pieces, leaving about 10 or so loose pipe cleaner pieces to be used for fill-in. 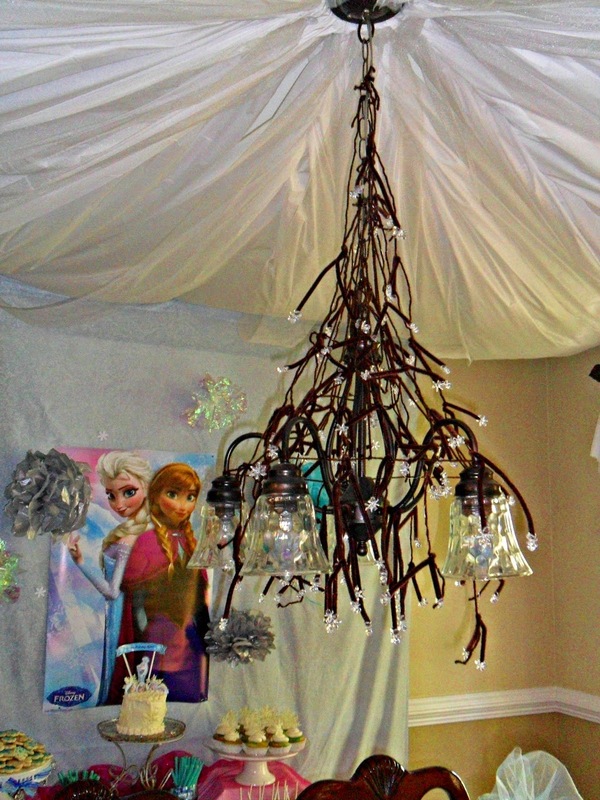 I then created a frame on the chandelier out of brown wool and draped the snowflake pieces on to the frame. Finally, I used the loose pipe cleaner pieces to fill-in any holes. The walls were draped with white sheets, save for the dessert table which received a pale blue sheet with faint white patterns that looked a bit like swirly snow to me, to cover my very autumn-themed art work (the above picture was taken prior to the white sheets being applied!). 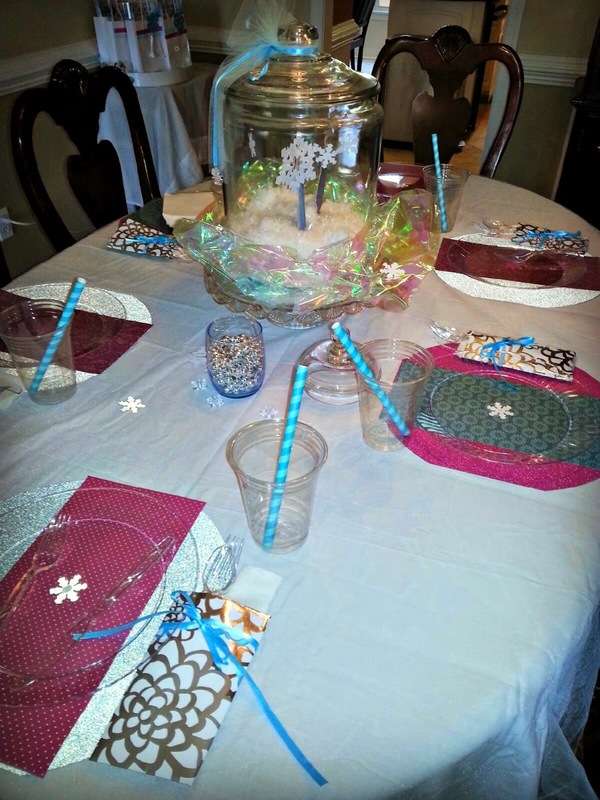 The table received the royal treatment with clear acrylic plates embellished with die cut snowflakes, on top of glittery card stock place mats in coordinating colors. Metallic wrapping paper envelopes, tied with a ribbon bow, held cutlery and napkins. 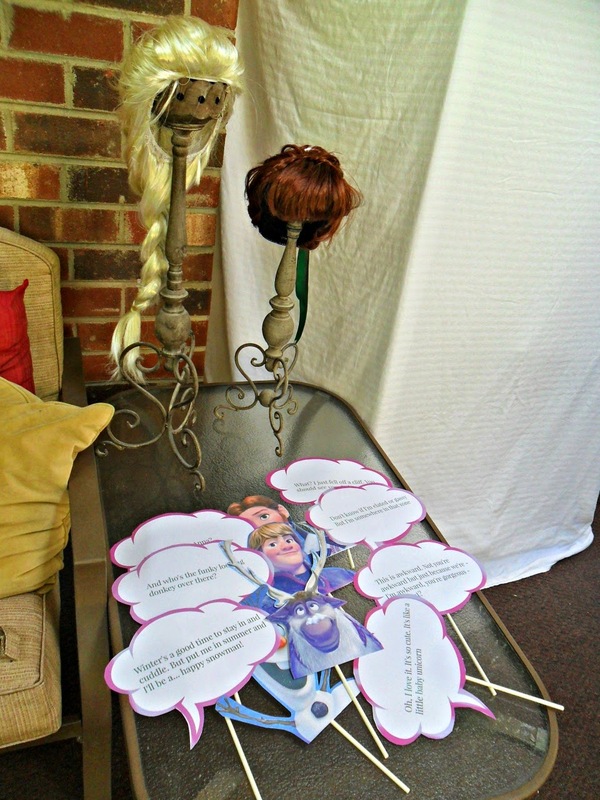 The centerpiece was made from printed card stock cut-outs, attached to dowel pieces. To stand them, I inserted the dowel pieces into half of a Styrofoam ball, and covered the balls with artificial snow. 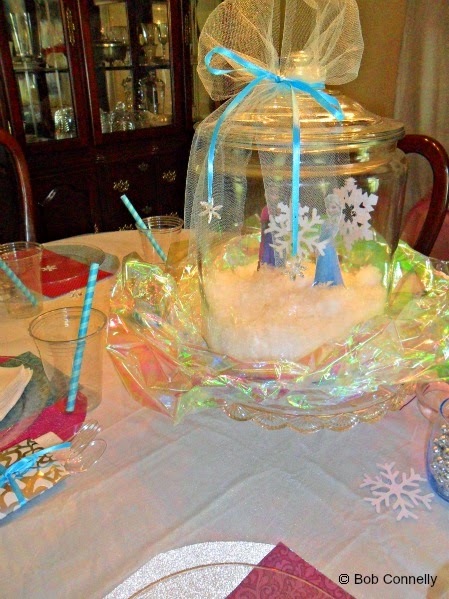 The snowflakes were suspended from the lid of the jar using fishing line and clear tape. 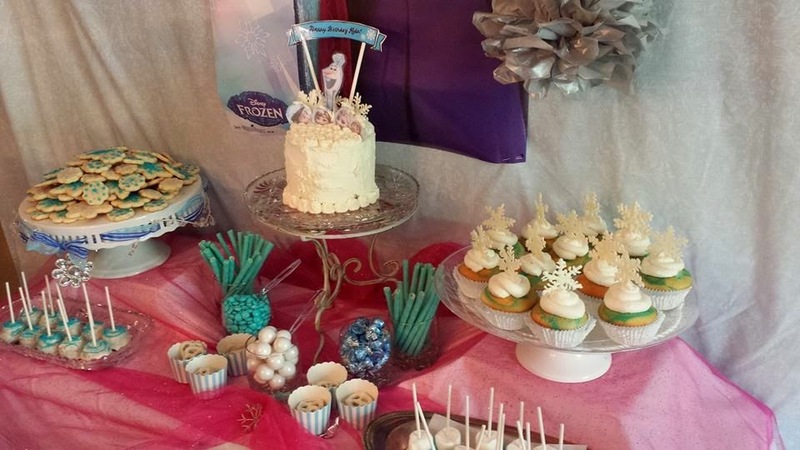 The background behind the dessert table received my only non-DIY decoration – a poster of the sisters – surrounded by glittery tissue puffs. The dessert table was draped with yet another white sheet and layer of fuchsia glitter tulle. In the center? A snowflake ornament. The table itself presented us with a perfect time to pull out our crystal and silver platters. With all of that pretty taken care of, food was up next up. I often serve punch, as it’s a bit more cost effective than serving individual soft drinks, and it’s easy to incorporate the beverage in to the theme. Too, I find the kids especially love having a signature drink – it makes them feel especially fancy! “Frozen” Punch was a bit of a last minute concoction. It was easy enough to put together with Berry Blue Typhoon Flavor Hawaiian Punch, Lemon-Lime soda, Lemonade, and one package of Berry Blue Jello powder. Add ice and stir. A handful of re-usable ice cubes in blue and pink kept the punch cool, as well as added a bit of themed color to the drink table. With pizza as our main lunch course, I mainly concentrated on the dessert table. The brownie bites were store bought, and dipped in white chocolate. 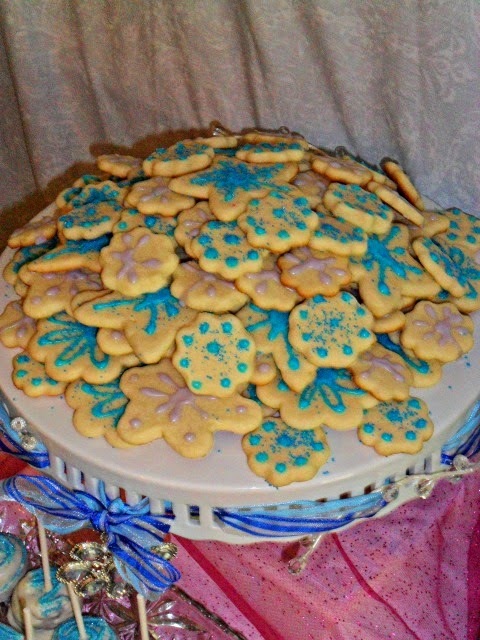 Once set, there was a quick addition of blue candy melts, piped on to the tops, then sprinkled with blue sugar, while still wet. 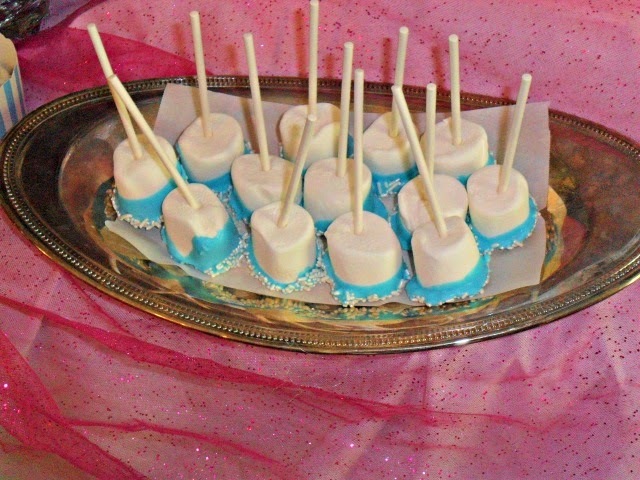 The marshmallow sticks received a similar treatment – dipped in blue candy melts – melted, of course – then rolled in white, opalescent non pareilles. The cookies were baked, painstakingly decorated, and delivered with a smile by Melinda, the Great, my neighbor and great friend partner-in-crime, complete with a decorated platter. We are so lucky to have friends like Melinda! She.Makes.The.Best.Sugar.Cookies.Ever. Then it was on to the main event: The cake and cupcakes! I went through a phase where I thought I wanted to be the cake boss-ette – I even had a business name – Twirly Whirl Cakes – catchy, isn’t it? The phase quickly passed once I figured out how much work and time was involved with every cake. I love making them, but it was just too stressful and time intensive to become a full time gig. Too, the 20+ pounds I gained over taste-testing the butter cream, actually made my decision to get out of the cake business pretty simple. I know – go figure. Now-a-days, I pour a bit of that creativity in to my family’s cakes. Unless absolutely needed otherwise, we usually skip the fondant and go with homemade butter cream with an improved boxed mix recipe. I have a lot of fun coming up with something that reflects each person’s personalities or theme. 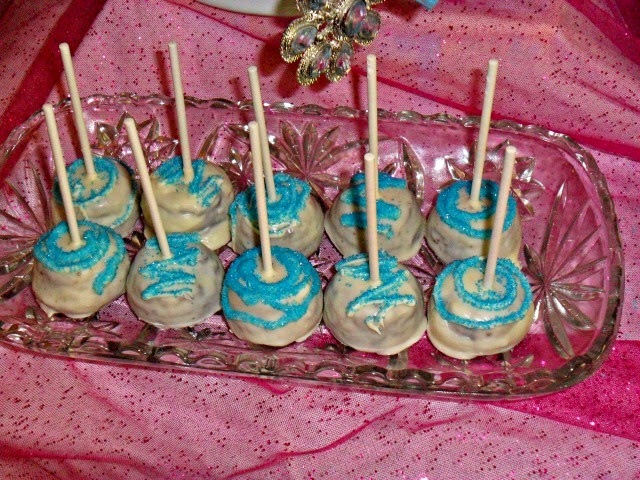 The cupcakes were marbled blue velvet cake and vanilla cake, with a frothy, marshmallow butter cream. 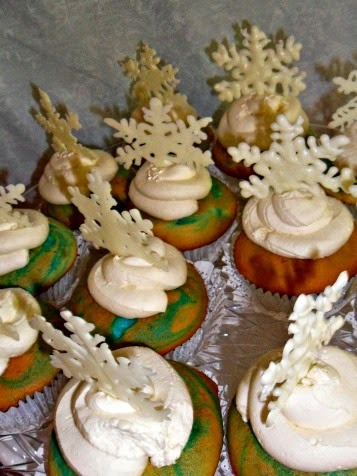 The snowflake toppers were made two days earlier by piping melted white chocolate on to wax paper over a snowflake stencil. Once set, they were carefully removed and stored in an air tight container until party time. Time consuming, but worth it for the effect! 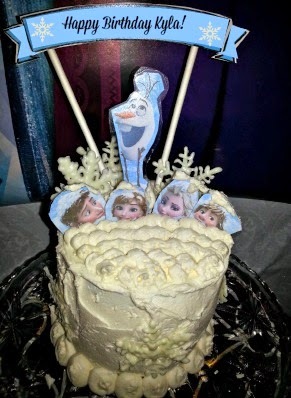 The cake was modelled after a fun Disney wallpaper I had come across during my Frozen stuff search..
..and thought it would be super fun, and unique, to re-create in a cake. I simply printed off the wallpaper image, laminated and cut out each individual character and placed appropriately. I also included the same chocolate snowflakes used for the cupcakes. The cake was blue velvet with a vanilla butter cream frosting. Yummy! With the food and cake out of the way, we moved on to some fun activities!I thought it would be really fun to have a photo op and dress-up activity, complete with costumes, wigs and props. It was a little challenging coming up with a design for the costumes and putting them together, but I was so happy with how they turned out that it was all worth it. Hopefully, I’ll have a chance to put up a tutorial on how I made them closer to Halloween. 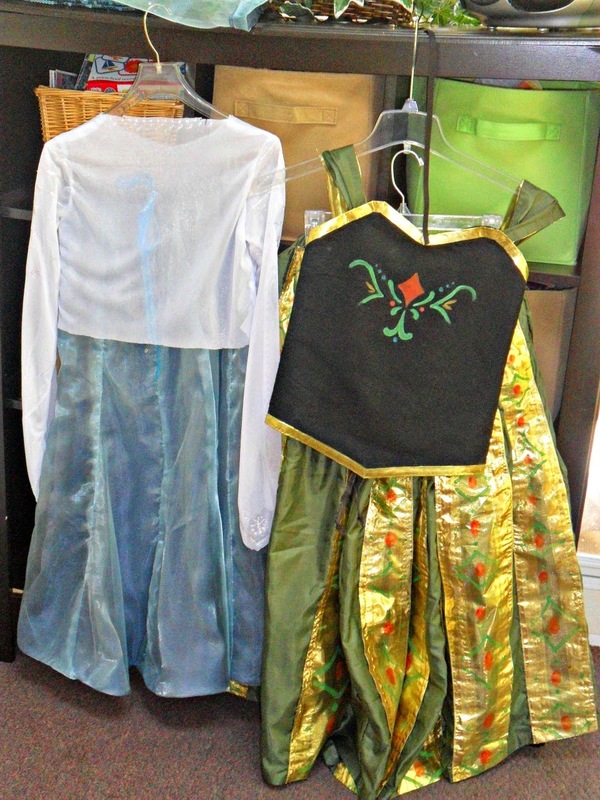 The costumes were made by hand, out of various fabrics and altered clothing pieces. Anna’s coronation dress was my favorite. I ordered undressed wigs very inexpensively, and dressed them myself using various tutorials found on Youtube. 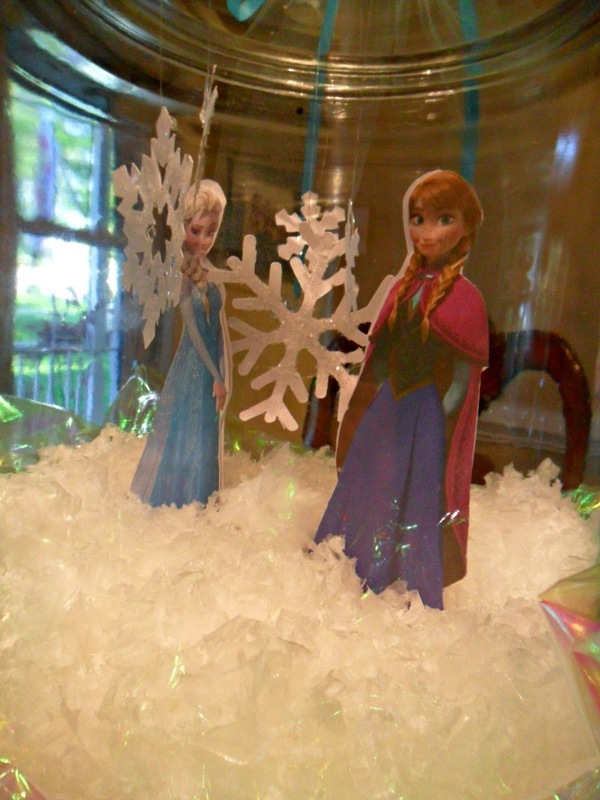 My favorites were by Kayley Melissa – Anna can be found here, and Elsa here. Props included various quotes from the movie, as well as our favorite supporting characters from the movie. 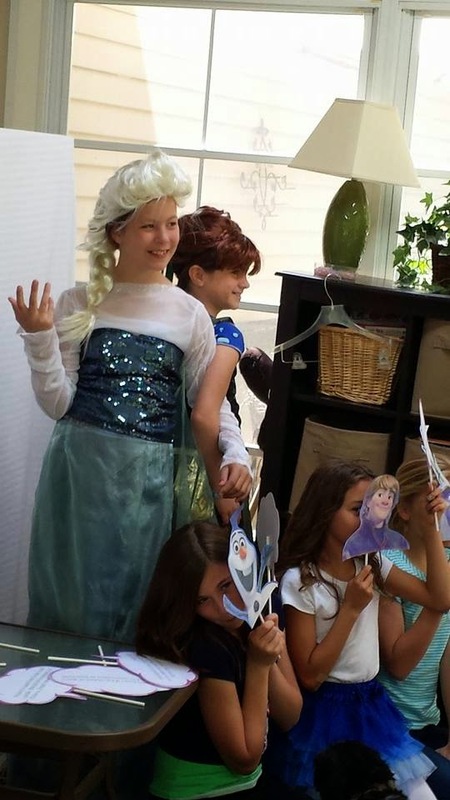 All the girls had a chance to dress up as both Anna and Elsa and we took a million pictures. 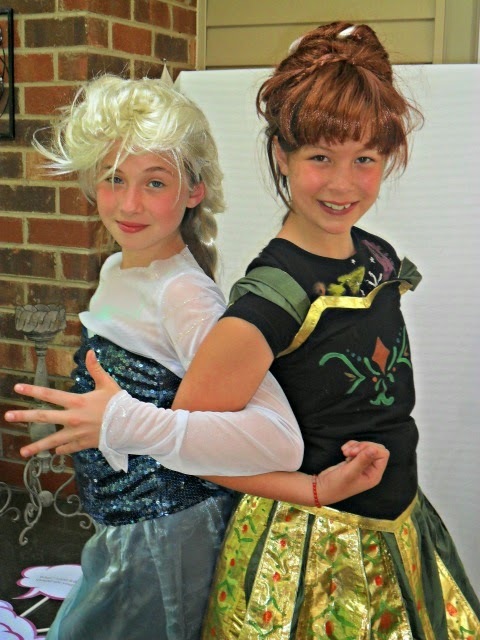 My favorite is definitely our very own resident Anna and Elsa! 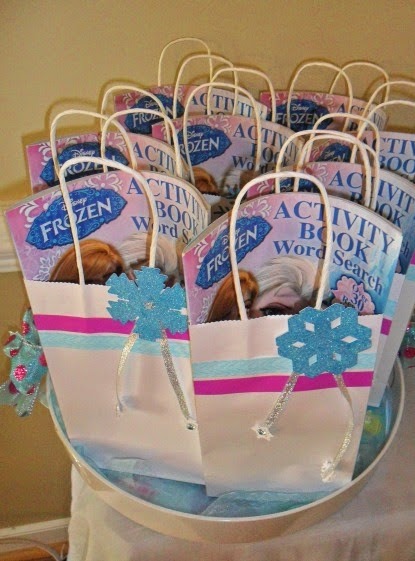 To end our afternoon, each guest received a goodie bag containing a Frozen Activity book, Extra “Polar Ice” gum, jeweled nail files, lip gloss an assortment of candies. Our final activity? After a quick costume change.. Ice skating, of course! Fun was had by all and, as usual, I had a slew of helpers to make the day a success – Thank you to all of them! It’s hard to believe next year I’ll be writing about her 11th birthday – better get started enjoying every moment of her tenth year possible. Thanks for following along! 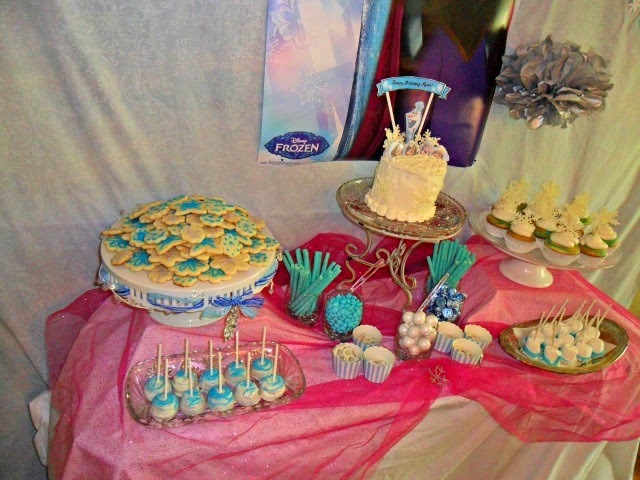 For even more Frozen fun, check out my Frozen Party Pinterest Board! I think you are amazing! Kyla is one lucky girl to have you for her Mom!